Have you noticed that the times you had the courage to listen to your inner voice the results were better than you could have even predicted? And not only for you but for everyone else involved? When we say your “inner voice,” we’re not talking about the critical parent, or the scared child or the addictive impulses that speak to you from inside your head. The Inner Voice we’re talking about speaks to you from a place of silence within. Your Inner Voice knows the perfection of creation and that we live in a benevolent universe. The Inner Voice is patiently waiting knowing that if you’d only listen your life would be so much more miraculous. This voice is always trying to get you to listen but many choose to listen to the other voice instead – the one that responds to doubt and fear because it’s louder and often more logical OR to the advice and opinions of others who are seeing the world from their perspective, not yours. 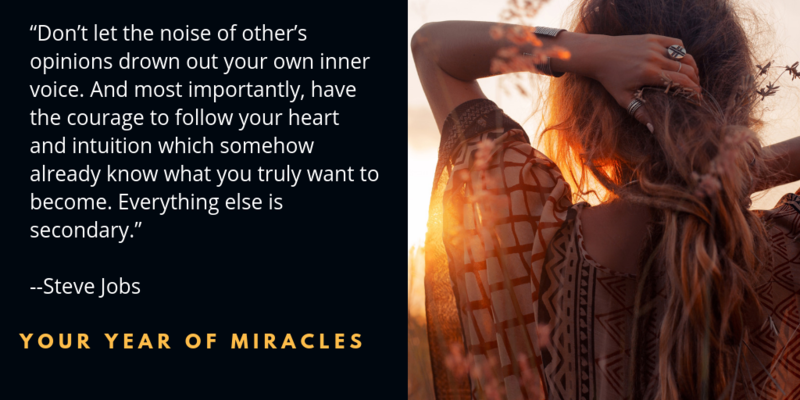 Debra recently had an experience of listening to her inner voice and I (Marci) was the one who tried to say, “Don’t do it,” until I realized what I was doing and I turned it around and gave her my full support and more miracles than we could have imagined have resulted…. Several months ago, my inner voice started saying to me that it was time to move on from Your Year of Miracles and pursue some of my other dreams. I have to say that I didn’t listen at first because it made no logical sense. I love YOM. I love our community. I’ve seen all of the amazing miracles that occur in people’s lives who are in our program and the quality and quantity of these miracles just keeps growing every year from soul mates found to book deals signed, from long standing health problems disappearing to money appearing from seemingly nowhere…And not only finding love but people sharing that their self love has blossomed and so much more. Why would I want to move on from this? But that gentle voice was very persistent and I realized I had to live what we taught and I had to listen to that voice for my own happiness and personal truth and because I knew that when you do what’s best for yourself it will always be what’s best for everyone else. So I told Marci I have to follow that voice and at first she resisted, because, as we said, Your Year of Miracles was only getting better and better and it made no logical sense for me to move on—but listening to your inner voice is seldom logical…. So we both took a deep breath and did what we teach others to do, we listened to our inner voices and trusted in the Universe and the magic in my life has been beyond what I could imagine and what is happening in Your Year of Miracles is well, miraculous. Actually, beyond miraculous. Proving to us both, once again, that when you follow you inner voice it will not only be good for you but good for everyone else. I (Marci) will certainly miss working this closely with you, as it has been a blast these past 5 years, but you are deeply embedded in the fiber of the Year of Miracles program, so you’re always with us. And the universe is always supporting expansion and evolution, so we have invited two extraordinary women to join us in the 2019 Your Year of Miracles program. The amazing Dr. Sue Morter, and the amazing Lisa Garr. Dr. Sue Morter is a Master of Bio-energetic Medicine and founder of the Morter Institute for Bio-Energetics. She is true visionary in the field of energy medicine and natural healing. Lisa Garr is the founder of the Aware Show, Inspirations on GIAM TV and Becoming Aware on Hay House radio as well as being a beloved talk show host on KPFK-FM in LA and WBAI-FM in New York. We have all known each other for many years, we are soul sisters and we are looking forward to the next evolution in the Miracle Zone. Debra, you and I are always family, you are an exceptional woman and we all completely support you on your next adventure that will certainly be a great contribution to bettering people’s lives. So as Marci and I continue to be each other’s biggest cheerleaders and are more committed than ever to follow our inner voices to our greatest good, let’s all commit that in the coming weeks we’ll listen to that inner voice even if it seems to be leading us in a different direction than our logical minds would have us go, and please share with us the miracles that we know will unfold for you. So since this is my last miracle moment (although I’ll be back as a guest once in awhile), next time along with Marci you will enjoy the amazing Dr. Sue Morter. I send my love and look forward to us meeting each other again someday soon, in the Miracle Zone. Desire to seek, patience to doubt, fondness to meditate,slowness to assert, readiness to reconsider,and carefulness to dispose in order, are the qualities of a scientific mind. That should be a plaque up on the wall of every office! So glad to see you affirming the wisdom of the inner voice. In the Bible’s book of Proverbs it is lady wisdom Who was with the creator in the beginning of the universe who is calling to everyone. I have had several careers and have been in a stall recently. But I said, I will hear my inner voice and it will tell me what I want to do now. Today, I heard a very quiet voice tell me to pursue a career that I had made an attempt to during the Recession and it never went anywhere. A little while the self-doubter came out, telling me I have ADHD and it is unikely that I will be successul even if I get a job in the field, because I have trouble finding locations, even within buildings…And there would be a lot of new buildings I would have to navigate in this career. However, I am not afraid to get started. I am sure I will find away around these obstacles. So thank you for your words and work. I need to savor your words here….I read them very quickly, but they really helped me to shift my perspective and return me to the goal of the miracle zone. Love that you are going to “savor” our words. It’s such a blessing to be able to not only hear, but to actually listen to that inner voice. And also that you were able to identify that “self-doubter”. You are miraculous! Congratulations, Debra. Best of luck. Awww, thanks so much, Pat! Thank you, Marci and Debra! I wish you a happy and safe holiday season! Wow! Dr Sue Morter joining the program! Mind blown!